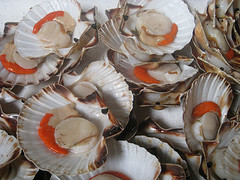 1, Cooking with Epic, Epic Ingredients, London 101, Restaurants - let's eat chic, Shopaholic abroad, Travel - bon voyage! Every so often on a Saturday, I’ll trek across town (and the Thames) to shop at Borough Market, always returning with enough food to feed a small European state and cursing at the lack of space in the refrigerator. If you love food, it’s a great day out. If you don’t love food, it’s still a fascinating experience, but honestly, who doesn’t love food? Apparently, Borough Market in its first incarnation was already in existence when the Ancient Romans built the first London Bridge. That makes me scratch my head in absolute wonderment. 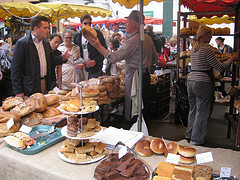 The Borough Market of today has existed on the present site for the past two and a half centuries. Let’s work that out… So people have been shopping here at the ‘modern’ Borough Market, since Robert Adam was alive and well, with his buildings popping up all over the place, and when George III was on the throne, only not quite properly bonkers yet. On a recent visit to Borough Market, we bought bread from the bread stall that sells everything from baguettes to heavy, round loaves baked with rosemary and rock salt, olives, sundried tomatoes and other delicious flavours. Then we moved on to a chocolate stall where massive blocks of pure wickedness stood in ultimate temptation as crowds pushed their way to the front of the queue. 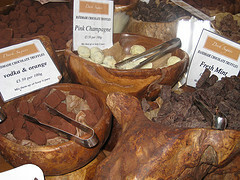 Next door we found truffles in all sorts of exotic varieties, including vodka and orange and pink champagne. 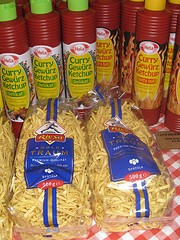 But we couldn’t leave without picking up some spaetzle for the cupboard, from the German stall that sells all sorts of wurst and pickles with huge bottles of curry sauce. 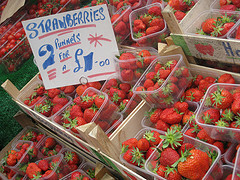 Through the crush of foodies and tourists we found a friendly Cockney shouting out deals on his strawberries “Two for a pound!” (that’s punnets, not individual strawberries. If London ever gets that expensive, it’s definitely time to move). Our noses twitched as we moved towards the seafood stalls where fresh fish, prawns and scallops in their shells sit on cooling beds of ice. Next it was time to pick up some Belgian beer at the shop where shelves groan beneath a library of both imported varieties and English ales. I love Kriek, so a couple of bottles went into the bag. As we rounded a corner, there was a busker singing incredibly badly into a microphone. His spot under a railway bridge echoed the already deafening assault on our ears so we walked quickly away, in search of lunch. 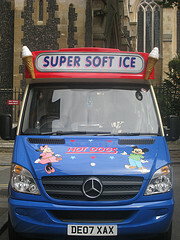 En route, the busker’s straining voice was replaced by the tinkling jingle of an ice cream van. Then, fatigued from the crowds and our now heavy shopping bags, we retreated for lunch at Fish. For first-time visitors to Borough Market, be warned: it heaves with visitors. But all that crush is worth it for the atmosphere and friendly stall-holders who’ll talk for ages about their organic ostrich steaks or unusual spice blends and how to use them. It is, however, a costly excursion so unless you can afford to get carried away, it’s probably wise to stick to a budget and remind yourself that no, your fridge is not the white-wear equivalent of a tardis for food storage. I just visited your blog and love it. REALLY good food ideas to inspire the food lover. 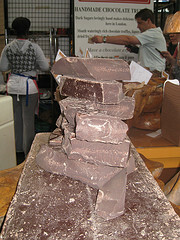 Borough Market is one of my clients, i send out regular produce and goings on updates to chefs, journo’s etc. my own pals now like getting these updates as well? if anyone is anyone interested, or if you know anyone who might be interested, please pass on my email address and get in touch! thanks for your comment. I’d love to receive your update. Sign me up! Will let all my foodie friends know about it, too… I think you’ll have a fair number of people getting in touch, somehow. Barry Topp’s New Forest Cider stall is always worth a visit. Ask to try some of the new Normandy style sparkling cider fermented with a dash of cassis. Hi Andy – thanks for the tip. 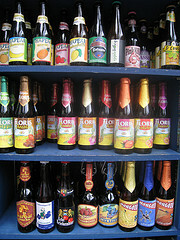 I need French cider for my next galettes-fest! Will you be at the meet-up tonight? I have been a trader at Borough for nearly eleven years now. My business, Northfield Farm, owes its existence to enthusiasts such as yourself. I am just dipping a toe into the water with my own blog. Keep the good work up.